This post is about poker and it is plagiarism. In my defense, I am plagiarizing me. Mojo made one of those standard run bad posts. The hands he held were big pot hands. On its best day, it is a dangerous position. 60:40 gives you an advantage. It does not provide a guaranteed win. No preflop hand offers that. I even describe a prefop situation that is as good as it gets — probably 98:2. Dave rightfully uses an overall read to justify his actions. It is a valid justification. The real question is how valuable is an early gamble? Sometimes it is great. I remember doing it with JJ and then going card dead and it still got me one of my better paydays. We encounter exceptions to all the rules. But what do we really love that makes us who we think we are? Often it is an implied odds hand that was foldable in other situations. The fact is that big hands promulgate variance along with success. 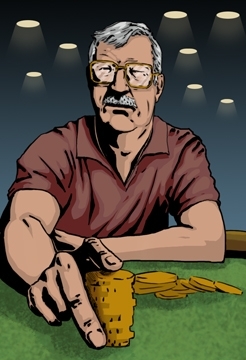 I tend to limp more with low blinds based on the typical player mix — ignoring position. It takes about 5 online blind changes to get me purposely upping the aggression factor. Today seemed a great example of big pot poker. It is live by the sword time to seek big pot poker. Dave has also talked about how he can lay down a “big” hand. If K’s and even A’s are learning events it is because they can be too easy to go broke with. I’m guessing the day was atypical. The basis for that varies. We all have them and only later recognize how we end up where we ended up. Cards can contribute as we see. Let me ask this. If you are the better post flop player, why wouldn’t you want to visit a lot of less expensive pots? Why wouldn’t you seek better options when there are too many holding position? It is questions similar to these that I believe Dave has figured out and that have brought success. That is it in a nutshell. You do what you have to do and take the chances you want to take to get to late play fun where you can hopefully bring the a-game out and polish it. For a yuck, I do remember a 3-way holding KK against an AA. The yuck is number 3 also held KK. That KK actually won when the board four-flushed the river. Hand calculators recognize one-percenters without emotion. We don’t when they hit. Think about the hand being played by three limpers instead of three all ins. The board then shows a very coordinated flop that mostly misses your hand. What does the better post flop player do when the option is committing? Refer to some of Dave’s earlier posts, if you don’t know. You are using WordPress 3.3.2. Akismet has protected your site from 4,133 spam comments already. Stop Spammer Registrations has prevented 33630 spammers from registering or leaving comments. The links are to plugins for Word Press. WordPress has a lot of nice plugins. Before having the latter plugin, I have had around 40 pending approvals based on probable spam. SSR compares the IP address of the one attempting to post with known comment spammers. Askismet catches based on content. The two together catch them all. During one of the BBT matches, I had a chance early on to push with a flush draw against Waffles. My thinking was that the tournament competition was so tough that I needed a big stack or else I would get pummeled. I therefore took the chance and hit the flush, sending Waffles into one of his better rants. He just never seemed to accept that I knew exactly what I was doing and took a huge chance. I wanted the stack so badly that I was willing to go out of the tournament early. Of course, the other factor was that only first and second place got a ticket to the final — therefore my decision. Waffles is still bitter about it ’till this day. And as you might know, I caught some cards and used the stack to bully my way to a victory in that tournament. Sometimes things just work out. The old saying, “There’s more than one way to skin the cat.” applies well to poker and the playing style we select. Of course Waffles may want to point out that the suggested play for an acknowledged weaker player is to force all in decisions on the better player. But, if that happens, hilarity will ensue. At least in central Illinois. Well reasoned decision can always look dumb in hindsight. Or have Big Bang Theory grade brilliance. Question for the day: Why do they call something so uncommon common sense? And really on most of these, there’s no right or wrong answer, players with different styles succeed, if you has three top pros how they wouuld handle a specific situation, you’ll likely get four answers and they’ll all be right. But just yesterday I came across an old post of Poker Grump’s site where he was chastising Josie for one post where she was uncharacteristically going into a tournament with a “lotsa limping” strategy. He references an Ed Miller column (more known for cash games but the principle is the same). Found it very interesting. If you limp a lot, you’re just playing “make a hand poker” which doesn’t give you an edge over anyone playing the same way. All of this plus your comments is much food for thought. It depends makes a better mantra the Ommmm — especially for a poker player. Limps or small raising is part of a small pot strategy. Negreanu seems its strongest proponent these days. Mojo with the hat mentioned the limps seen ahead of him often making a limp close to a value bet of sorts. I understand the raise to isolate strategy. I used it more earlier on than now. Then, when that doesn’t work you built a pot that is likely to give you odds to continue participating. That is the danger. Early on I’d talk the weaker strategy based on small pot but not really follow it well. I started playing a little Stud8 tournament that taught me playing that limit game a lot about playing no limit. There the blind progression dictated strategy far more noticeably than you find it with no limit. It really brought home the insignificance of early aggression. Well maybe not insignificant but certainly much lower importance. From no limit I brought the idea of watching your “M” for playing guidance. Putting all that together give one the basis for proper decisions. I think that the hatted one has had that down. The compliments I have directed is way hinted or pointed at that. I believe he’s locked onto how flow relates to proper selection. That’s negated a lot of the variance that tournament play adds. Is it be better to maintain optimal aggression patterns with greater variance? Or, is using aggression a better component to associate with your “M” and the average “M” to minimize variance? They both can work. In that limit game I watched certain players use it on an ongoing basis. I didn’t share that many final tables with them. You need to establish the optimal path to follow. There is another factor which is site selection. Dave understands the local structure and uses it to his benefit. To me, that is another related key. All that is a lot to package and an easy place to error. Dave’s idea expressed on KK struck me as atypical. Put that in the FWIW category. P.S. With a full head of hair, I don’t have the same hat requirements as others. I thought the Grump was a little hard on her. I would never play that way, but VJ makes it work. She reads players well and isn’t afraid to push them around when she smells weakness. The limp strategy can work, just not my style. About the case when there are limpers ahead of me: I allow myself to limp behind them. With limpers, a hand like 10h/9h is a great hand. I don’t want to push others out. I want them to come into the pot. I’ll either hit something or I won’t and the hand will be easy to play. To raise takes a big hand because you’re building a big pot. I said 10h/9h is a great hand, but it’s not a big hand, so I limp along. If someone behind me raises, I’ll usually fold and have lost very few chips. It’s a great hand because it’s easy to play post-flop. It’s a great hand because you can get someone’s stack if they are stubborn. It’s not a big hand, however. Funny you should mention 10/9, MOJO….or maybe it wasn’t an accident. In my current post (aka, “the pasta post”), I talked specifically about how I got killed on that very hand, limping with it (tho in my case, it wasn’t soooooted). Flopped top 2, which I thought was hitting me really big. But the guy to my right flopped a friggin’ straight and I doubled him up. Never gonna limp with THAT hand again. Funny how any hand from AA to 27 can be misplayed. I say that from experience.